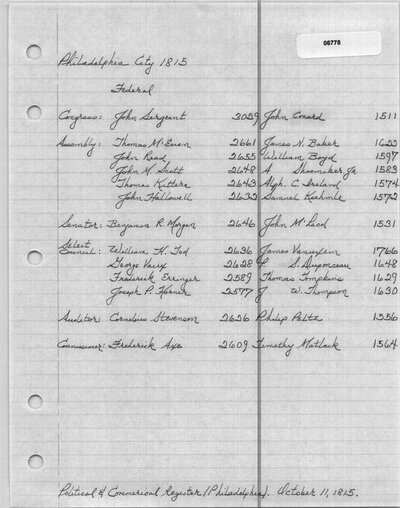 The Democratic Press (Philadelphia, PA) from October 18, 1814 lists 2625 votes for Cornelius Stevenson in Philadelphia City. The Democratic Press (Philadelphia, PA) lists the returns of Lower Dublin, Byberry, and Moreland Townships under "Bustletown." October 14, 1815. The Democratic Press (Philadelphia, PA) lists the returns of Oxford Township under "Frankford." October 14, 1815. The Democratic Press (Philadelphia, PA). October 11, 1815. 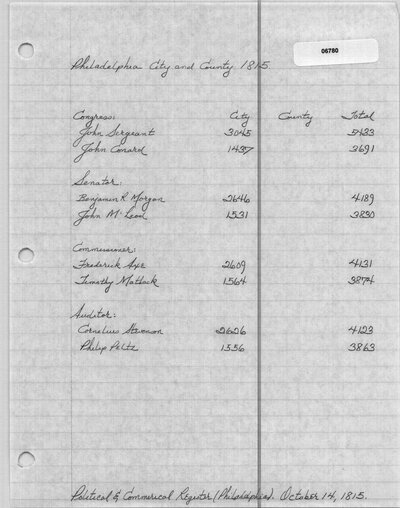 Political and Commercial Register (Philadelphia, PA). October 11, 1815. The Freeman's Journal and Columbian Chronicle (Philadelphia, PA). October 12, 1815. Poulson's American Daily Advertiser (Philadelphia, PA). October 12, 1815. Relf's Philadelphia Gazette. And Daily Advertiser (Philadelphia, PA). October 12, 1815. The Democratic Press (Philadelphia, PA). October 14, 1815. 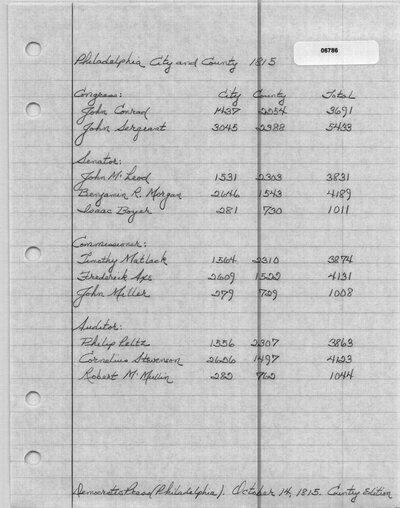 Political and Commercial Register (Philadelphia, PA). October 14, 1815. Poulson's American Daily Advertiser (Philadelphia, PA). October 14, 1815. United States' Gazette (Philadelphia, PA). October 14, 1815. Relf's Philadelphia Gazette. And Daily Advertiser (Philadelphia, PA). October 16, 1815. The Democratic Press (Philadelphia, PA). October 18, 1815. The Freeman's Journal and Columbian Chronicle (Philadelphia, PA). October 18, 1815. United States' Gazette (Philadelphia, PA). October 18, 1815.